Top-Rated Faculties: For IIT JEE Coaching, we have lined up some of the best faculties in Kota to provide high-quality study material to all aspirants. Our learned teachers have prepared online HD video lectures to help students understand the most complex topics in a very simple & easy way. These subject matter experts have years of experience along with in-depth knowledge of their respective subjects (Physics, Chemistry and Mathematics). Yearlong & Complete Courses: As discussed already, JEE consists of 2 papers, JEE Main and JEE Advanced. Only those who qualify JEE Main can sit for JEE Advanced. Covering the entire syllabus for this exam is no joke and candidates need to put in their best to cover it fully. Thus, a lot of students start early with their preparation to make sure no topic leaves uncovered. The well-designed cost-effective yearlong courses at India’s no. 1 online coaching are created in a very student-friendly manner. It covers every topic and concept in detail. The IIT-JEE Video Lectures are available in Mobile, USB and VOD for easy access. The content is revised timely to match the standards set by the Indian Institute of Technology. 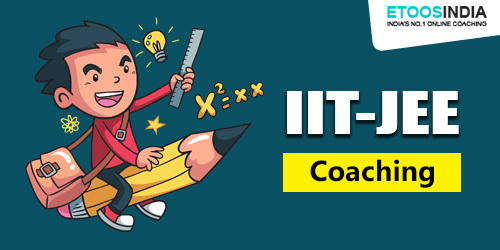 Topic-Based Courses: During the IIT JEE Coaching, a student might have to suffer if he is unable to grasp the concepts of a particular topic because coaching institutes do not tend to repeat a topic for a single student. 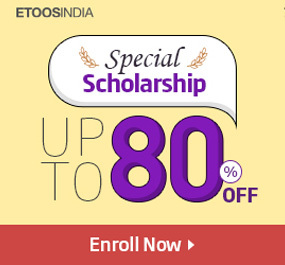 ETOOS solves this problem by providing topic-based courses for the preparation of IIT-JEE. If you are having a hard time understanding any concepts of a single topic from Physics, Chemistry or Maths, then need not to worry. Just choose the topic from our topic courses and get started with the online video lectures. Simple! Problem Solving Techniques: The difficulty level of JEE exams is no new for anyone of us. A candidate appearing for this prestigious exam to overcome the difficulty level has to develop a smart problem-solving approach. In this regard, new courses have been rendered by our faculties to make JEE aspirants familiar with the nature of questions & pattern that is generally asked. Exam papers from previous years have also been solved in a systematic manner. Final Revision: Post completion of the syllabus, it is mandatory to revise what you’ve learned so far. The formulas and definitions need to be on your tips if you wish to crack this exam in a single go. To help students revise effectively, our final revision courses are developed to keep you up with all important topics and formulas. Online Test Series: Online test series is an important part in IIT JEE Coaching. These assess what your knowledge of the subject and help evaluate a student’s overall performance. Talking of our online test series, it ranges from a period of one month to 12 months. More than 50 thousand practise questions, 10+ mock tests and previous year solved papers are available. This will make you familiar with exam pattern and boost confidence. So, shape your career with ETOOSINDIA and start with your IIT JEE Coaching now! If you still aren’t convinced, then try our free trial by registering on our website and check out yourself. 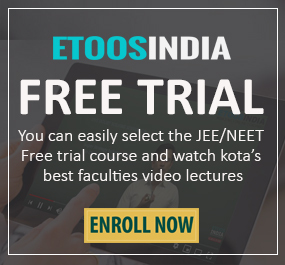 Also, gain insights about JEE and other entrance exams by following Etoos blog! Do let us know your views about this one in the comment section below. Thanks for sharing this excellent content about IIT JEE coaching. Your blog made to know more details about NEET and JEE exams. Keep blogging!